I’ve been chatting to Bob of Figment Factory — who created our HeroGridz tiles — about doing a second set of sewer tiles. I want to reach out to you to find out what you’d like to see added, what themes you’d like covered and your general thoughts on the new line. Drop a comment here or hit us up on Facebook, Twitter or Google+. We’d love to hear from you. We’ve also made it easier to collect HeroGridz tiles. Now you can buy individually printed tiles from One Bookshelf sites. Need an extra T-Junction? Just buy what you need, without having to buy another core set. We’ll be adding straight sections and junction/entrance tiles later in the month. You can also check out our 1 inch tile line, I’d love to put more sets of those out if there’s much interest. I’m back, and with the Japanese festival of the dead (ooh, spooky) I’ve had some time to sort through my collection of cool and bring you some geekness (geekiness?). Neat huh? I think the logo really gives you an idea of what the game is about and gave me a chance to practice my Photoshop technique. I’ve been working on more art too and talking to a proper artist who will hopefully grace our humble game’s pages with his L33t skillz. The Pewter Tankard Tavern is not new to many of you, as it appeared in the Sentinels Watching series here on the blog awhile back. If you haven’t seen it yet, it’s an 11″ x 8″ grid map, perfect for printing on A4 paper and sets out a typical tavern scene. I’ve since updated the map and polished it up to what you see before you. 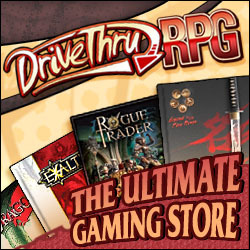 The PDF, which includes a list of adventure hooks, should be available from Drive Thru RPG in the next few days. And, as always, my minions (me) are churning out the goodness here at Phoenix HQ, but I always have time for a chat, so why not drop a comment below.